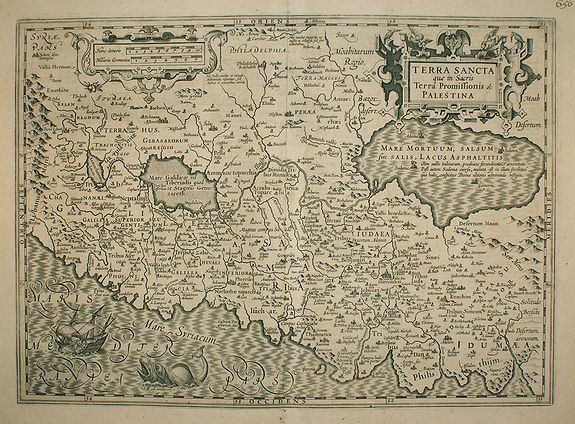 HONDIUS -Terra Sancta que in Sacris Terra Promissionis ol: Palestina. HONDIUS, J. - Terra Sancta que in Sacris Terra Promissionis ol: Palestina. Terra Sancta que in Sacris Terra Promissionis ol: Palestina. - HONDIUS, J. Title : Terra Sancta que in Sacris Terra Promissionis ol: Palestina.. Size : 14.0 x 19.5 inches. / 35.5 x 49.6 cm. Description :This map of Palestine extending from the Lebanon mountains to the Dead Sea is based on the large map by P.Laicksteen and C.'s-Grooten in the latter part of the sixteenth century. Prized for its decorative qualities, the map has fine cartouches, sailing ships and sea-monsters. Condition : Nice and dark print. Paper age-toned.